You’ve probably heard that breakfast is the most important meal of the day. However, this is largely a myth. Although it may be true for some people, others actually do better when they skip breakfast. Additionally, eating an unhealthy breakfast can be far worse than not eating at all. A healthy breakfast includes fiber, protein and healthy fat that gives you energy and makes you feel full. In contrast, an unhealthy breakfast can make you feel sluggish, cause you to gain weight and increase your risk of chronic disease. Here are the 10 worst foods you can eat in the morning. Many people think breakfast cereals are a nutritious choice for children and adults. Cereal packages often include health claims, such as “contains whole grains.” A label may also suggest the cereal is a good source of nutrients like vitamin A and iron. In reality, these cereals are highly processed and contain only a small amount of whole grains. Also, nutrients are artificially added in a process called fortification. One study found that children who consumed a fortified breakfast cereal designed to improve immune function ended up getting sick just as often as children who didn’t consume the cereal (1). Breakfast cereals contain mostly refined (not whole) grains and sugar. In fact, sugar is usually the first or second item in the ingredients list. The higher on the list, the greater the quantity. A 2011 report by the Environmental Working Group (EWG) examined some of the most popular breakfast cereals consumed by children. It found that a 1-cup serving often contains more sugar than 3 chocolate chip cookies. Even “nutritious” cereal choices, such as granola that contain oats, are often loaded with sugar. A high sugar intake may raise the risk of obesity, type 2 diabetes, heart disease and other chronic health conditions (2). Bottom Line: Many breakfast cereals are even higher in sugar than cookies and desserts. Adding whole grains or artificial vitamins and minerals does not make them a healthy choice. Pancakes and waffles are popular choices for weekend breakfasts at home or in restaurants. Both pancakes and waffles contain flour, eggs, sugar and milk. They are cooked somewhat differently, however, in order to achieve a distinct shape and texture. Although they have more protein than some breakfast items, pancakes and waffles are very high in refined flour. Many researchers believe that refined grains like wheat flour contribute to insulin resistance and obesity (3, 4). In addition, pancakes and waffles are typically topped with pancake syrup, which contains high-fructose corn syrup. High-fructose corn syrup can cause the inflammation that drives insulin resistance, which may lead to prediabetes or type 2 diabetes (5). Pure maple syrup is a better choice than pancake syrup, but it’s still high in sugar, which adds empty calories to the meal. According to the American Heart Association, most people consume 2–3 times the recommended daily upper limit for added sugar (6). Bottom Line: Pancakes and waffles are made from refined flour and topped with high-sugar syrups. They may promote insulin resistance and increase the risk of obesity, type 2 diabetes and other diseases. Toast topped with margarine may seem like a good breakfast choice, since it doesn’t contain saturated fat or sugar. However, this is actually an unhealthy breakfast for two reasons. First, because the flour in most bread is refined, it provides you with few nutrients and little fiber. Because it is high in refined carbs and low in fiber, it can spike your blood sugar levels very fast. Elevated blood sugar leads to rebound hunger that causes you to eat more at the next meal, which can make you gain weight (7). Second, most margarines contain trans fats, which are the most unhealthy type of fat you can eat. Food manufacturers create trans fats by adding hydrogen to vegetable oils in order to make them appear more like saturated fats, which are solid at room temperature. While studies have not shown saturated fats to cause harm, trans fats are definitely bad for you. There’s a massive amount of evidence that trans fats are highly inflammatory and increase your risk of disease (8, 9, 10, 11). Also keep in mind that margarine can be labeled “trans fat free” but still contain trans fats, as long as it is less than 0.5 grams per serving (12). Bottom Line: Toast with margarine raises your blood sugar and insulin levels, causes rebound hunger and increases your risk of weight gain and heart disease. Despite a reputation for being healthy, most muffins are just small cakes in disguise. They’re made from refined flour, vegetable oils, eggs and sugar. The only healthy ingredient is the eggs. In addition, commercially sold muffins are often very large. One review found that a typical packaged muffin exceeds the USDA standard portion size by 333% (13). The dramatic increase in portion sizes over the past 30 years is believed to play a major role in the obesity epidemic. Sometimes muffins are topped with additional sugar, or filled with chocolate chips or dried fruit, further adding to their sugar and calorie content. Bottom Line: Muffins are usually high in refined flour, refined vegetable oils and sugar, all of which are very unhealthy. Fruit juice is one of the worst choices you can make if you’re trying to avoid hunger, weight gain and chronic disease. Some fruit juices on the market actually contain very little juice and are sweetened with sugar or high-fructose corn syrup. High sugar levels increase your risk of obesity, metabolic syndrome, type 2 diabetes and other diseases (14, 15, 16). Even 100% fruit juice contains a lot of sugar. Consuming large amounts of fruit juice can have the same effects on your weight and health as drinking sugar-sweetened beverages (17). Drinking fruit juice causes your blood sugar to rise very quickly because there’s no fat or fiber to slow down absorption. The resulting spike in insulin and drop in blood sugar can make you feel tired, shaky and hungry. Bottom Line: Despite a reputation for being healthy, fruit juice is very hign in sugar. It actually contains a similar amount as sugary soda. Toaster pastries are an undeniably quick and easy breakfast option. However, their ingredients are anything but healthy. 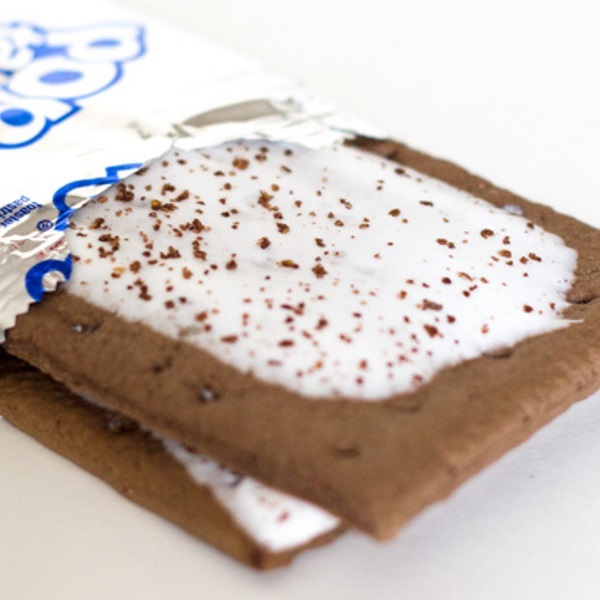 For instance, Pop Tarts contain white flour, brown sugar, high fructose corn syrup and soybean oil. The health claim “baked with real fruit” is highlighted on the front of the box, in an attempt to persuade you that these pastries are a nutritious breakfast choice. In addition to being high in sugar and refined flour, toaster pastries only have a couple of grams of protein. One study showed that women who ate a breakfast with 3 grams of protein and 44 grams of carbs were hungrier and consumed more at lunch than women who ate a high-protein, low-carb breakfast (18). Bottom Line: Toaster pastries are high in sugar and refined carbs, yet low in protein, which can increase hunger and food intake. Scones topped with jam are truly more like dessert than a meal. Scones are made by mixing refined wheat flour, butter and sugar with desired flavorings. The dough is then shaped into small rounds and baked. They’re usually topped with cream and jam or jelly. The end result is a high-calorie, sugary breakfast with little fiber and protein. Studies have shown that fiber has many benefits, including keeping your blood sugar well-controlled. It also makes you feel satisfied so you end up eating less (19). In one study, obese children reported feeling hungrier and less satisfied after eating a high-carb meal than after eating a high-protein, low-carb meal. Their hunger and satiety hormones also changed (20). Bottom Line: Scones topped with cream and jam provide little nutrition other than calories. Easily digested carbs and a lack of fiber can drive hunger, leading to increased food intake and weight gain. A bowl of plain, whole-milk Greek yogurt topped with berries is a great example of a healthy breakfast. However, a container of fat-free, sugar-sweetened fruit yogurt is not. In fact, many flavored non-fat yogurts contain more sugar than a comparable serving of ice cream. Fat helps keep you full because it takes longer to digest than carbs, and it also triggers the release of the fullness hormone cholecystokinin (CCK) (21). Removing the fat from dairy products and adding sugar changes a nutritious breakfast option into a food that is better suited as an occasional treat. Bottom Line: Non-fat sweetened yogurt is very high in sugar, and may contain more of it than ice cream. It also lacks the natural dairy fat that can increase fullness. Granola bars may sound like great breakfast options, but they’re often no better than candy bars. Although unprocessed oats are high in fiber, granola bars provide only 1–3 grams of fiber, on average. However, they contain a lot of added sugar. In fact, some of the most popular brands contain a combination of sugar, corn syrup and honey. Large amounts of these sugars can raise blood sugar, insulin levels and inflammation (22). Further driving up their sugar content, granola bars sometimes contain chocolate chips or dried fruit. The protein content of granola bars also tends to be low, further confirming that they are a poor breakfast choice. Bottom Line: Granola bars usually contain several types of sugar that negatively affect blood sugar and insulin levels. They also lack protein and fiber. Gluten-free diets have become very popular in recent years because of concerns about the potential negative health effects of gluten (23). While there’s no harm in avoiding gluten, eating many of the processed gluten-free foods now available may cause problems. For example, a combination of flours made from rice, potatoes and tapioca replaces wheat flour in gluten-free bread and baked goods. These flours have a high glycemic index, so they raise blood sugar rapidly. This rise leads to high insulin levels that can cause rebound hunger and weight gain (24). Also, gluten-free pancakes, muffins and other baked goods are no better than traditional wheat-based versions due to their low protein and fiber content. Bottom Line: Gluten-free packaged foods are made with flours that raise blood sugar, which may lead to elevated insulin, increased appetite and weight gain.They also lack protein and fiber, which contribute to fullness. Breakfast has the potential to set you up for a day of great energy levels, stable blood sugar and control over your appetite and weight. On the other hand, making a poor choice at breakfast can leave you hungry and struggling to get through the rest of the day. It can also increase your risk of developing health problems in the future. If you’re going to eat breakfast, make it one that contains protein, healthy fat and fiber from unprocessed, whole foods.